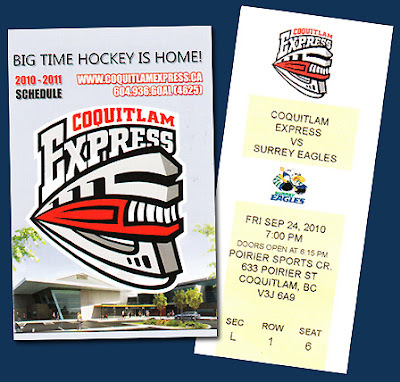 Last night I attended the Coquitlam Express home opener vs the Surrey Eagles. I visited the merch table but they was not much to be had a the home opener. They were selling copies of the Smart Hockey magazine with a game sheet stuffed into it for $2. Here is part of the story from that magazine about the Express: [As franchise relocations go, the Coquitlam Express didn't have to venture far or wide on their return journey home. The moving trucks only had a few turns to make and nobody had to bother packing a cooler or bagging a lunch. But while the distance travelled from Burnaby's Bill Copeland Sports Centre to their newly renovated home on Poirier Street measures out at less than nine kilometres, the team's owners, staff and players are anticipating a lifestyle change that typically accompanies a much more drastic switch in scenery. 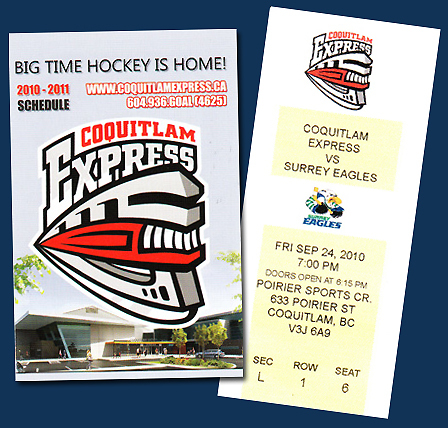 The Express spent their first four BCHL seasons in Coquitlam before construction surrounding their facility spurred the move to Burnaby in 2005. But the team never drew the crowds they had hoped for despite an RBC Cup winning season and the presence of high NHL draft pick Kyle Turris for two seasons. Now, they return to a city that never wanted them to leave and a renovated sports complex that gives the team a first class home. The Coquitlam Sports Centre has been given a full face lift that included expanding the seating to a full bowl that accommodates 2,000 spectators. The project, which was created through a partnership between the City, TASK Construction and CEI Architecture, employed a number of 'green' features including one that uses excess heat from the arena's refrigeration system to warm the nearby swimming pool and library. "The end result is an ideal environment for BCHL hockey and a vibrant atmosphere for the Express," says CEI partner Mark Hentze. "The replacement of the existing seats and the addition of some interior finishes have really added a big league feel to the arena." The calibre of the facility that awaited the team in Coquitlam made the decision to return an easier one for the Express's ownership team. "We wanted to make things work in Burnaby, but from a business standpoint it wasn't able to continue," says part owner and general manager Darcy Rota. "I've known [Coquitlam] Mayor Richard Stewart for a long time and he made it a priority to have the team come home." On the eve of their first season back in their original hometown, Rota has been impressed by the level of community and corporate support that has met the team's return since the official announcement was made on February 8th at a City Council meeting. As far as the arena goes, they have done a great job of taking an tired old arena and making it look much more appealing. The biggest improvement is that the arena now has seating all the way around the rink. I was surprised to see a smallish crowd out to cheer on the home team at their home opener. It looked like there were about 60% empty seats, so that would mean that there were about 800 fans in attendance. If I were working with the team in sales/promotions, I would have looked at the presales a week or two before the game and then started making all kinds of deals - 2 for 1 ticket sales, kids under 12 for free, free tickets offered to local schools etc - all to ensure that the home opener was a complete sell out which would create a lot of buzz for the team and hopefully for future games. I arrived at the arena just 20 minutes before puck drop so I didn't get to see what they had for the pre opening festivities outside the arena, but was disappointed to see the prices for their barbecue, a cheese burgers cost $5.50. I would have liked to see some sort of deal for free food, or at least very cheap food supplied by a sponsor. Offering up $2 burgers would have gone a long way in making the event seem more exciting. As for the on ice pregame festivities, what we got was about 12 young girls waking pom poms as the players were announced on the ice. This was just about one of the lamest home openers I can remember attending. It was a good game, and the home team won, but I have to say it didn't seem like the team management went out of their way to make this an unforgettable return to their home arena after so many years over in Burnaby. Lets hope the team does well this season and is able to make up for the off ice excitement with some on the ice!